Personalize this adorable and unique dog paw pendant with your dog's name and a genuine gemstone. Comes with a Sterling Silver Chain. Paw measures 3/4" tall x 3/4" wide (19mm). Gemstone measures 2.5mm in size (0.07 point in size). 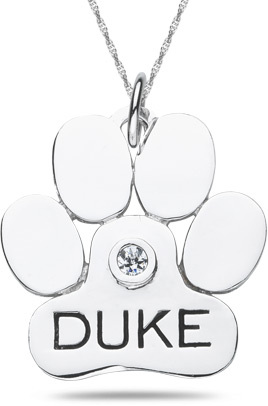 We guarantee our Personalized Dog Paw Pendant in Sterling Silver to be high quality, authentic jewelry, as described above.